Is Muhammad one of the most popular names for boys in England and Wales? A number of articles describe how Muhammad is the most popular name in the UK for baby boys, topping William and other names. Muhammad has replaced William in the top ten most popular boys' names in England and Wales. The Islamic name [(Mohammed)] overtook traditional choices like Jack, Thomas and Daniel to become the number one name in the West Midlands, Yorkshire and the Humber, and the North West, as well as in the capital, in 2008. Both articles also state that various spellings of the name are included. 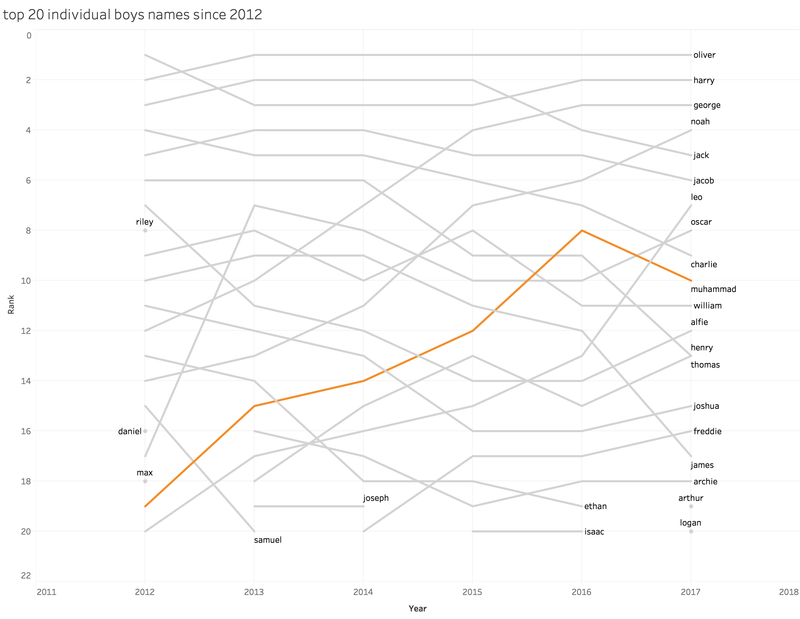 These are the official statistics for boys names in England & Wales, which contains everything we need to discuss those two articles. The following is based on the 2016 data, the latest available at time of writing. In England & Wales as a whole, not grouping names, the top name was "Oliver" (1.855%). 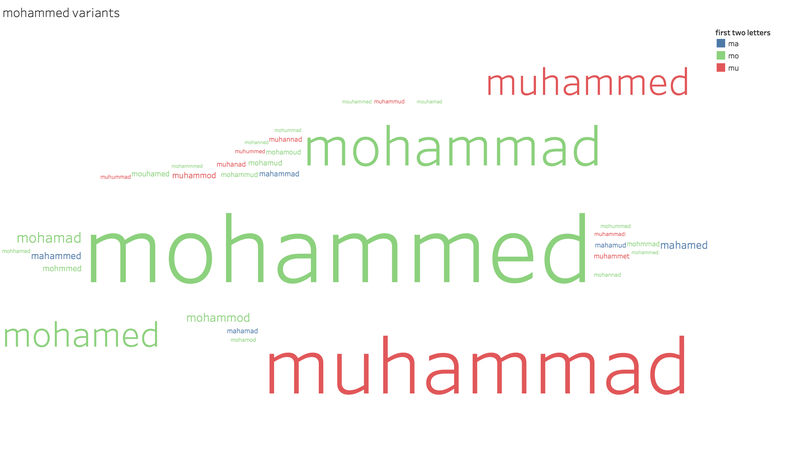 The top spelling of "Muhammad" was "Muhammad", 1.095%. Grouping, however, is hard. You need to decide what you're considering groups (do we group Oliver, Ollie, Olly? probably yes, but what about the cognate French Olivier?). That said, a quick look at the data makes it seem entirely plausible that if you group all variant transliterations of Mohammad would come out top. Counting all variants of ? ?hamm?d* and ? ?ham?d* (which should catch all spellings of Mohammad and double-barrel names starting with it) gives 2.284%. By way of comparison, Olivier, Ollie, Olly, Olivier sum to 2.236%. As for London specifically (by residence of mother), without grouping, Muhammad is the top name (1.23%), second is Oliver (1.02%). The problem with judging this is that there are a lot of variant spelling of Muhammad (since written arabic is an abjad–so doesn't have written vowels–transliterating the Arab original to the Latin alphabet gives, effectively MHMD with freedom to fill in whatever vowels seem closest to the pronunciation). And some other names should also possibly be grouped (as the other answer says is Ollie the same as Olly?). On the other hand all the variant spelling of Mohammed represent a single arabic word whereas the "related" English names are deliberately chosen variants. with all the others adding a little over 300 more uses. In 2016 the variant Muhammad appears as 8th most popular and in 2017 the 10th most popular boys name. So it looks plausible that if we could agree a single transliteration of the name Muhammad, it would be the most popular name for boys in the UK. To put this in perspective the listed variants of Muhammad constitute about 2.5% of all boys names in 2016 but this may account for between 25% and 50% of all Muslim boys born in England and Wales (the muslim population is about 5% of the population but perhaps twice that of all births). The high frequency of the name is as much a consequence of the lack of variety of male names in the Muslim community as a it is of a large number of Muslims in the population. The source for this data is the ONS annual release of baby names for England and Wales. You can explore features for yourself interactively here. An alternative data explorer is here with data to 2016 but you will have to do some extra calculations yourself. Or you could just download the dataset and check. Mohammed variants are highly concentrated geographically in England and Wales. The ONS released local authority popularity data for the top 100 names with its 2017 update and this can be explored interactively here. The proportion of the population that is Muslim is 4.8%, while the most popular boys name in England and Wales (Oliver) was given to just 1% of babies that year. 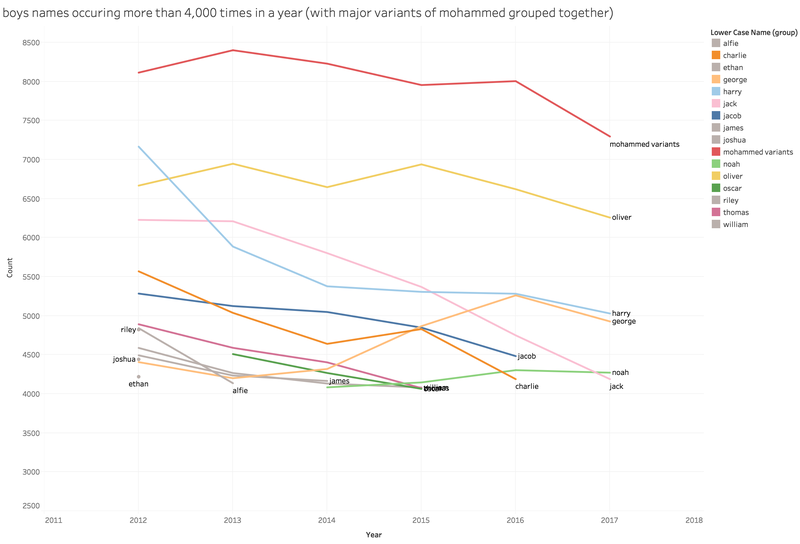 Muhammad’s 15th place is a demonstration of the lower variance of names within the Muslim community compared to others. When all the variations are added together, including Muhammad, Mohammed and Mohammad, the name comes out top with 7,445 counts. If you do that though, it’s only fair to add together the variations of other names. For example, Oliver and Ollie (7,749) or Harry and Henry (9,136). We can only wonder why the Daily Mail didn’t. This is a couple of years out of date now, though. In many/most mulsim countries, the "first name" Mohammed is not a "first name". It is a type of honorific. i.e. quite simply males get "Mohammed" as a sort of first name, and then their actual name follows. It's totally remarkable that this hasn't been mentioned. It's also remarkable that the many media articles which rabbit on about the various spellings of Mohammed (which is an irrelevant, obvious, uninteresting issue) don't mention this, the main issue. "He explains that the name is symbolically included as a first name, but it is not used in the way a Christian name would be – in Pakistan, for instance, a second name is often used as a “given” name." "In some Muslim countries, almost all males take a religious name, either Mohammed or one of the prophet's other names, Ahmed, Mahmoud, or Mustafa. Out of reverence for the prophet and also out of practicality, men and boys named Mohammed often go by another first name instead. In Egypt, the ubiquity of these compound names caused a major administrative problem in the mid-20th century,..."
When Can Muslims Use the Name Mohammed? "This is not a title like 'Mr.' nor is a first name as western people understand..."
"Md. stands for Muhammad or Mohammed. Thousands of Bangladeshi Muslims (male) use Md., the shorter form of Muhammad, before their names. This is not a title like 'Mr.' nor is a first name as western people understand. Although Md. is part of one's name, people never call anyone by this name. For example..."
"Everyone in Scotland and Eireland has the surname Mac-!" "All these professors have an honorific PhD!" "In Japan they accidentally have their first and last names reversed!" "In Iceland everyone's surname is dottir!" It's a (trivial) misunderstanding of the structure of naming concepts. Not the answer you're looking for? Browse other questions tagged united-kingdom sociology . Have any questions where the underlying cause was thought to have had both a psychological and social component been thoroughly settled? Are girls and boys pre-programmed to behave… like girls and boys? Were all but one of the US presidents descended from King John of England? Is refusing to decrypt data for the police illegal in England and Wales? Is it routine for Sweden prosecutors to travel to the UK to question people they are looking to arrest? Was the Obama administration responsible for the decision to move the UK embassy and the sale of the old location? Was the UK's drive to acquire civilian metals to use in WW2 necessary for the war effort? Could “Generation Z” be the most conservative one since WW2?